Today, it is the fastest growing media company in the world. 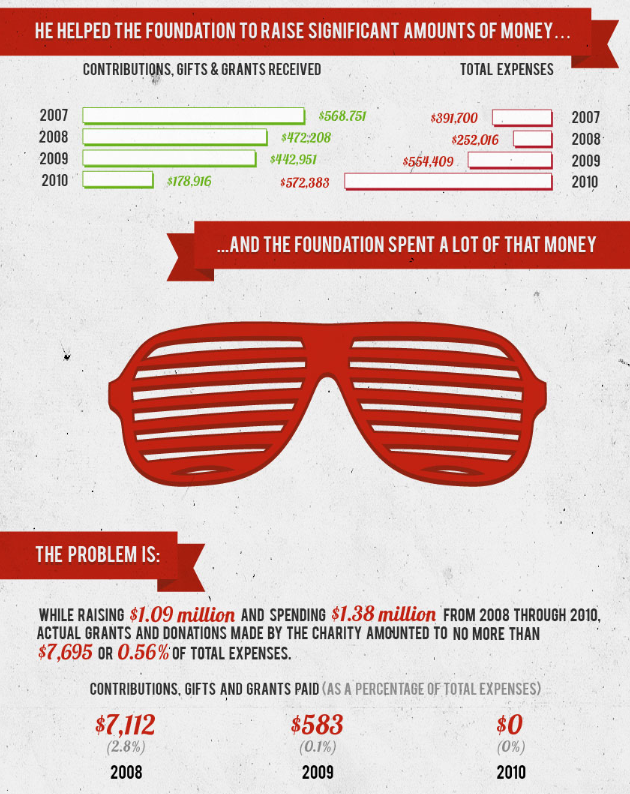 Upworthy finished October with 7 million monthly uniques, up from 6 million the month prior. In August, it hit four million uniques, up from 2.5 million in July. 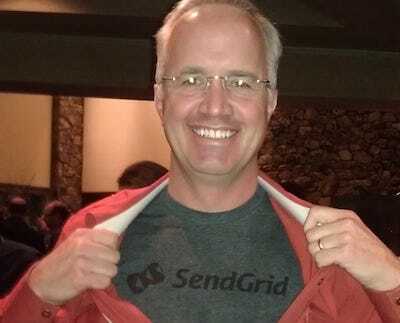 Its fast growth was rewarded with $4 million from investors. 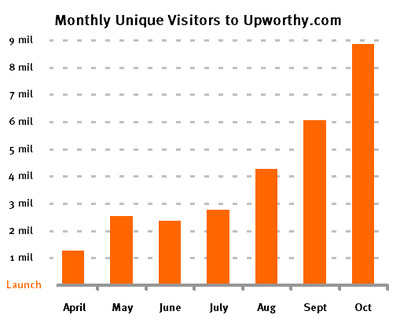 Are Upworthy’s growth and business model sustainable? We’re not sure, but either way the stats are impressive. We asked CEO and co-founder Eli Pariser what Upworthy has been doing to smash traffic records every month. Before he started Upworthy, Pariser worked for a digital, political publication, MoveOn. 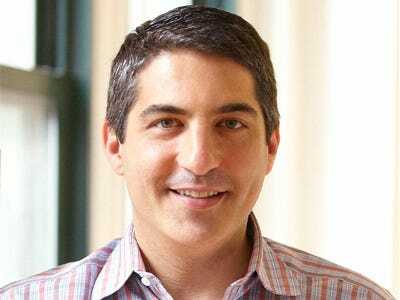 He and his co-founder, The Onion’s former Managing Editor, Peter Koechley, thought the upcoming election would drive traffic to Upworthy. But people weren’t sharing much of Upworthy’s political content, so the pair ditched that angle and broadened the site’s coverage. It can be tough for startups to let go of initial ideas and pivot to what’s working. But as soon as Pariser let go of! the pol itics angle, traffic soared. Upworthy’s curators don’t start their days surfing other websites for news. They surf social media outlets like Twitter and Facebook instead. Sometimes it’s easier to highlight a conversation than to start a new one. 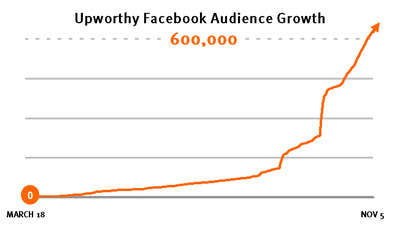 Pariser says Upworthy hasn’t done anything particularly brilliant to juice Facebook for traffic. It just spent a lot of time and energy cracking the social network. In Mark Zuckerberg’s interview at Disrupt yesterday, he said several things that Facebook investors should find encouraging. One of the big concerns about Facebook is that, as its users migrate to mobile, the company’s ability to monetize the users will drop precipitously, thus clobbering Facebook’s revenue. Zuckerberg said explicitly, for the first time, that he thinks Facebook will ultimately make money money per user on mobile than it makes on the desktop. If this proves true–and, importantly, if it happens because mobile revenue per user soars instead of desktop revenue collapsing–Facebook’s revenue growth should soon reaccelerate and then stay strong for years. Zuckerberg also said that search is a huge opportunity for the company and that Facebook is “uniquely positioned” to go after it. A few weeks ago, we suggested that Facebook could quickly generate an incremental $3 billion of revenue if it jumped into the search business. If Facebook really does aggressively go after the search opportunity, therefore, this could create a major new growth engine. Lastly, Zuckerberg made several comments about how everyone is now “underestimating” Facebook. Reading between the lines, this is encouraging both for the near-term and the long-term. With respect to the near-term, Zuckerberg knows exactly how Facebook is doing this quarter, and we suspect he would have been very hesitant to use the word “underestimating” i! f Facebo ok were likely to blow the quarter. Longer term, the word choice suggests that Facebook thinks investors are, in fact, underestimating Facebook’s revenue potential. Now, of course, none of this changes the fact that Facebook’s stock is still expensive (~30X next year’s estimated earnings), which means the market is counting on revenue reaccelerating this quarter and remaining strong for the next several quarters. And none of it changes the concern that, in October and November, employee lock-up releases will likely lead to additional insider selling–possibly a lot of it. But it does suggest that a new bull story for Facebook could start to emerge. 1) FB’s long-term focus: Nothing new here, but FB is clearly focused on the long–term and creating value over next three-fiveyears. – on mobile they see more engagement and time spent per user versus desktop, mobile users more likely to be DAU’s and twice as likely to use it six out of seven days a week. – over time, thinks that mobile monetization is more tv-like than desktop. – have made mistakes on mobile. 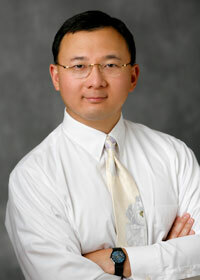 Most notably, too early a focus on HTML 5 as opposed to native apps. Correcting that now, though he did note that currently more time spent on mobile web FB than on apps. 4) Search – Perhaps the most notable comments of the presentation were in regards to search and their long-term view that FB has unique assets to help answer questions. – already doing 1 billion search queries per day (and not even trying). – most searches are to find other people, but many! also fo r pages/brands and apps. – stated that search represents a “big opportunity” and that search is one obvious thing they could do in the future. – there is already a team working on search, but wouldn’t say how big or clarify if it is doing anything beyond the current search functionality. However, we thought his search comments were the most interesting of the presentation and that he clearly thinks that FB and its social graph are uniquely positioned to improve search in the future. 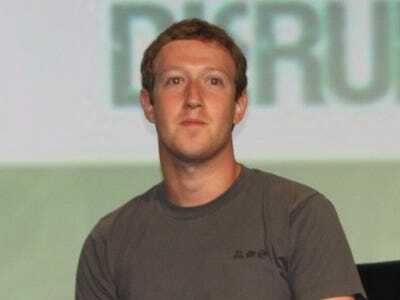 7) FB’s mission – Reiterated the long term mission is to connect everyone on the planet and make the world more open and connected. Stated that making money goes hand in hand with this mission and that they need to do both in order to do either. 8) Company morale – When asked about company morale, stated that stock price doesn’t help, but focused on the fact that FB has always been controversial and that there is cyclicality in terms of how people think about FB. Right now seems to be on the downside, but he likes that, as he thinks it is when people underestimate the company. – When they are underestimated, it gives them latitude to take big bets. Positive comments on Mobile. Zuckerberg indicated that ! Facebook and its mobile potential are being underestimated. Mobile users are spending more time per person on Facebook than desktop users and are 2x as likely to use Facebook in 6 of the past 7 days (L6/7). We also believe mobile DAUs are likely higher than web DAUs. In terms of mobile monetization, Zuckerberg indicated that Facebook can make more money from a mobile user per time spent than a desktop user, and that mobile ads in their early days are already performing better than ads on the right rail of the desktop. As published in our recent Facebook report from 9/4/12, we estimate Facebook’s mobile ad revenue could be more than $200M this year and above $900M in 2013 driven by higher CTRs and CPMs. Our analysis also suggests mobile ad revenue/user/month could ultimately be higher than on the web as higher engagement and pricing offset the lower number of impressions per visit. See page 2 for our proprietary model, which segments Facebook’s ad business into Mobile SS, Web SS, and Web Marketplace. Search on Facebook’s radar. Facebook currently generates ~1B search queries a day—the majority attributed to people search, but also a meaningful portion related to brand pages and apps. In late August Facebook launched Sponsored Results—ads displayed in the search dropdown bar—to capitalize on this opportunity. However, Zuckerberg indicated that Facebook could do more with search in terms of providing users with direct answers to their questions, likely based on information derived from the social graph. This is likely more headline risk for Google than a real, near-term fundamental concern, but the two companies could ultimately overlap more in search down the line. 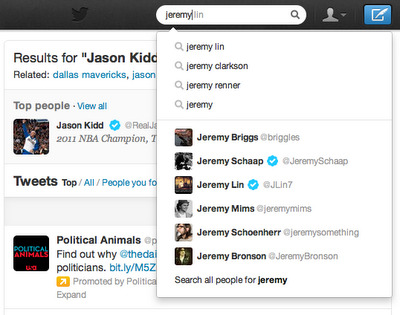 2) Search is impt and they are working on it. 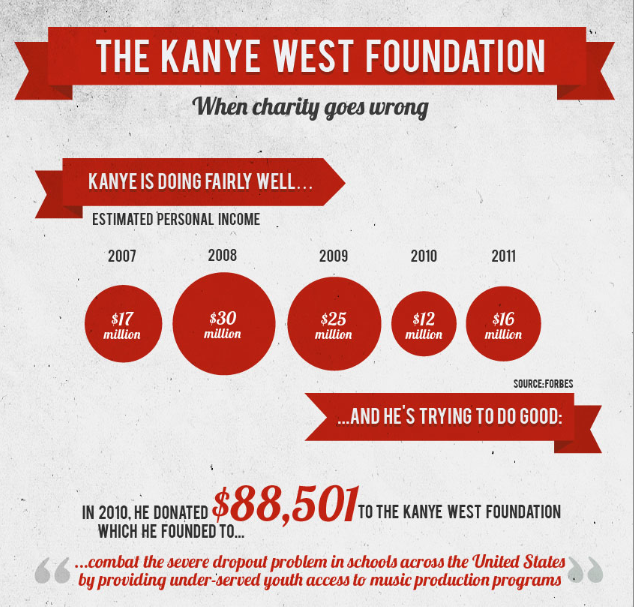 Once again, this can be very lucrative if done correctly. New revs. 4) he’s very focused on mobile and realizes how impt it is. Interestingly, he thinks it monetizes better than desktop. 10) I was disappointed that there was no discussion about the insider selling…. Think headliner Madonna was the highlight of Sunday night’s Super Bowl halftime show performance? According to ClearSpring, the most tweeted about/Facebooked/e-mailed/printed/overall social-media’s most clicked upon celeb of the night was none other than Cee Lo Green. 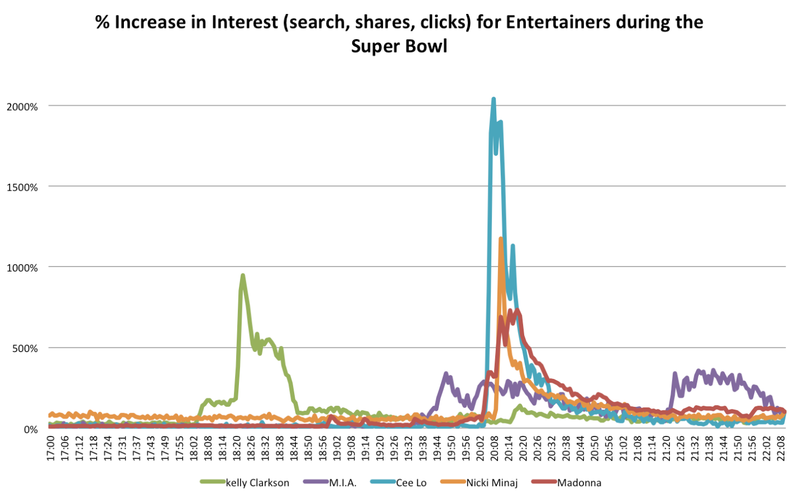 Cee Lo beat out not only Madonna as the most talked about on the internet during the big game, but also Kelly Clarkson, M.I.A. and Nicki Minaj. 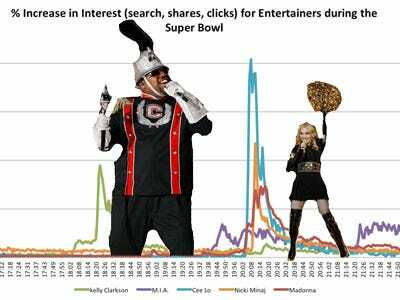 After taking the stage dressed as a band leader and dueting with Madonna on “Express Yourself” and the grand finale, “Like a Prayer,” Cee Lo fans freaked, causing his online presence to surge to over 2,000 percent above normal—and nearly double any other Super Bowl act. 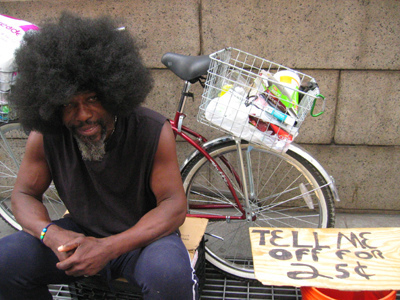 Homeless marketing – they hold up a sign and hope that passersby will look down, read the sign, then stop, take out their wallet, take some money out, and give it to them. What’s the probability of that happening? What are the chances they will even get a glance? Same thing happens with TV ads, print ads, radio ads, and all forms of traditional push ads. Where is the value exchange? There is none.